Are you a fan of silent films? Are you looking for something different to do? If so, the Richmond Area Arts Council (RAAC) has the event for you. 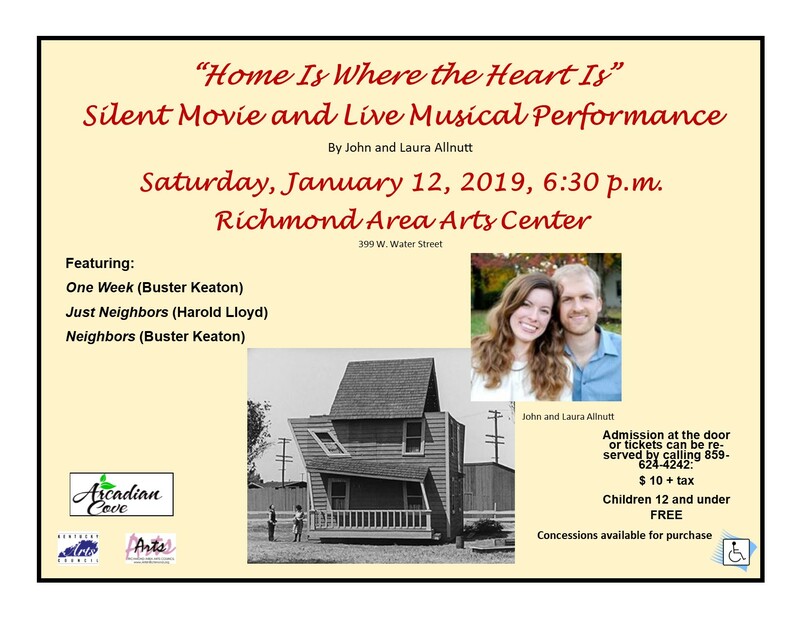 The Richmond Area Arts Council will be presenting Home Is Where the Heart Is, a collection of three short silent films accompanied by live musicians. The music will be provided by John and Laura Allnutt as part of their Sounds of Silents series. The presentation will begin at 6:30 p.m. on Saturday, January 12 at the Richmond Area Arts Center, 399 W. Water Street. The presentation will include films that feature performances by some of the most talented actors from the silent film era: One Week (Buster Keaton), Just Neighbors (Harold Lloyd) and Neighbors (Buster Keaton). In the 1920s it was common practice for live musicians to accompany films. The Allnutts continue this tradition by creating modern soundscapes as they incorporate piano, synthesizers, a drum set, marimba, and numerous sound effects to accompany the films. John Allnutt earned his bachelor’s degree in percussion performance under professor James Campbell at the University of Kentucky. Throughout his undergraduate years Allnutt was a member of the Cavalier drum and bugle corps in ‘03, ‘04, and ‘06 when they earned two DCI world championships. He completed his Master's in Music Education at Southern Methodist University in 2012. John is an active member of the Percussive Arts Society and an artist with Innovative Percussion, Inc.
Laura Allnutt, a graduate of the University of Kentucky with a bachelor’s degree in piano performance, teaches piano with passion, precision, and patience. Laura teaches privately at her home studio, and her pedagogical training is extensive. Laura presented a flash talk on incorporating yoga into piano lessons at the SMU Institute for Piano Teachers, and she enjoys composing piano duets for beginners and creating audio tracks to accompany her students. By incorporating elements of classical music, jazz, video game music, and their own original compositions, the Allnutts help 21st-century audiences connect with films that were popular in the 1920s. They want to spread their love for American film artists such as Buster Keaton, Harold Lloyd, and Winsor McCay by making these events accessible and entertaining to all ages and demographics. Refreshments will be available for purchase for a nominal fee. Admission is $10.00/person. Children 12 and under are admitted free of charge. Tickets can be purchased at the door. For more information call 859-624-4242 or email Director@ArtsinRichmond.org.